A while back (more than a year ago, I'm almost ashamed to admit, but more explanation to follow), I had the delightful opportunity to speak candidly with Todd Zion, the President and CEO of a pharmaceutical startup company called SmartCells, Inc. For those of you who aren't familiar with SmartCells, they represent the rational future of insulin replacement therapy, one that is not burdened with endless calculations, hypoglycemia, and one that eliminates the kind of testing many now require to obtain reasonable "control" (surely a misnomer under circumstances like these, but I digress). 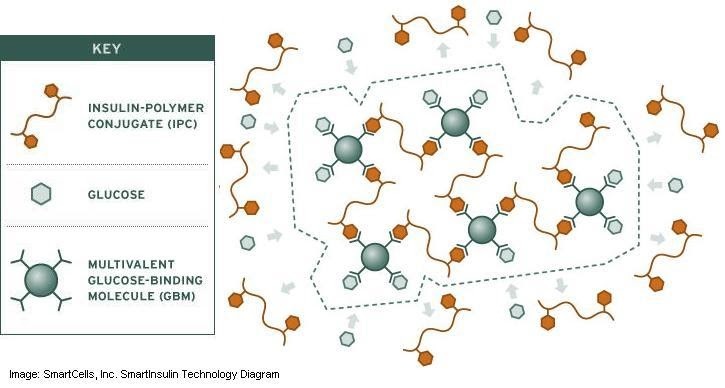 SmartCells basic concept is to encapsulate human insulin nanoparticles in a polymer that would theoretically "detect" a diabetic's glucose levels automatically, and therefore release only the appropriate amounts of insulin at precisely the right time to keep blood sugar levels steady. The big deal is that it would completely eliminate hypoglycemia, and also significantly reduce the burden of blood testing. I first communicated with Dr. Zion while he was still a graduate at Massachusetts Institute of Technology (MIT) earlier this decade. He had seen my glowing editorial about his work which caught his eye -- enough to be featured in his early presentations made to venture capitalists. While my conversation with Todd Zion was an interview of sorts, I had only a few preset questions to guide the interview, preferring to let him do the talking. That was one reason why I never published my juicy take-aways, rather than blab them to the rest of the blogosphere! But after reviewing my notes, I've decided I could do sufficient justice now, so I've decided to break my silence. (OK, confession time, this brings to mind the old Depeche Mode dance track "Enjoy the Silence" to mind). I began by thanking him and asking how far along they were before human clinical trials could begin. He kind of hesitated to give me a definitive timeframe, but he did note that "preclinical" trials (on animals) were going very, very well, and suggested that that human trials could be ready as soon 2009 or 2010 (sign me up!). He noted that their insulin was working exactly as expected in animal models, which bodes very well for the next phase of testing required to commercialize their product. Naturally, a lot could happen before then, but it did sound promising. I then asked him about testing on larger primates since researchers at the Diabetes Research Institute at the University of Miami Miller School of Medicine published in the February 2006 issue of the journal Proceedings of the National Academy of Science showed that the composition of a human islet is so different than that of the rodent model that they concluded that NOD mouse model may no longer relevant for many human studies. 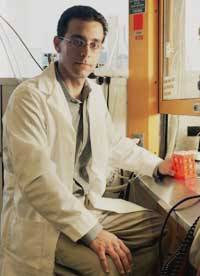 He noted that while the DRI finding was more relevant to the cytoarchitecture, or cell structure of islets and seemed to be more relevant to cell engineering than insulin manufacture or packaging, but added that was one reason why they preferred to do testing on animals other than the NOD mouse. He responded by saying that SmartCells had never worked with the NOD mouse, but instead preferred working with diabetic cats! Ironically, the Diabetes Research Institute scientists suggested the very same animal model as an alternative when asked at the 6th Annual Research Update in New York last year. Of course, its more difficult to find cats with insulin-dependent diabetes mellitus (IDDM), known in humans as type 1 diabetes. Because cats have longer lifespans than mice, they are also heavier, meaning their insulin dosages are more similar to humans (on a per kg basis) than mice are. Plus, they eat in a less predictable manner, making them more ideal for the kind of work SmartCells is pursuing. Mice and rats pretty much eat whenever you put food in front of them, while bigger animals (including humans) are not so predictable. In general, Zion sounded optimistic that his concept of encapsulating insulin molecules in a kind of a shell (that looks like a flower in diagrams) that opens only when glucose is elevated would ultimately prove itself, and in that regard, he seemed a bit on the cocky side, but then again, this is something that not one of the major manufacturers (Lilly, Novo Nordisk, Sanofi Aventis) is working on at this time. Novo's next generation insulins are basal-only (like Levemir) with the added benefit of not encouraging weight-gain. Sorry, that "benefit" (if it can be called a benefit) does not justify a price premium to me. But I also probed about his company's relationship with Jens Brange (who authored a number of scientific books on the subject of insulin and is considered one of the world's foremost authorities on the subject). Initially, Jens Brange was employed by Novo Industri A/S (now known as Novo Nordisk A/S, due to a merger). I think he was a bit surprised by my question, but he was also surprisingly candid. He said that Brange had been doing independent consulting in the field for nearly a decade, so he assured me that SmartCells' discoveries were not necessarily in Novo Nordisk's pocket as a result. He also noted that his venture capitalists would not allow that to happen even if he wanted it to because they all expect a return on their investments! He then confided that his suspicion was that assuming clinical trials work as anticipated, then ultimately, the product would be licensed to the highest bidder, not necessarily in the best interests of patients, but that seems a bit far off into the future at this point. I believe that the NIH/NIDDK, the ADA and JDRF should be lining up to buy the rights, rather than forcing the company to sell the rights to Novo Nordisk, Eli Lilly and Company or Sanofi Aventis. There is already a precedent on this (less anyone forget, Banting and Best sold the patents to insulin for $1 to make affordable insulin widely available in a fast manner). More recently, nonprofit enterprises are funding drug and product development to fill huge voids being left by private industry. A good example of what is going on now is JDRF's artificial pancreas project. Personally, I think JDRF would be making a wise investment by buying the rights when SmartInsulin goes up for bid (it would be helpful to ensure the JDRF organization is included among those that will receive bids) and then leasing it to the pharmaceutical industry, but I cannot be the only voice demanding it. Tell your JDRF chapter, call JDRF headquarters, write them letters. If anyone is interested, I can prepare some basic info. about the company you may share in your communications, but the important thing is that JDRF is accountable to you as shareholders, but they need to know what kind of investments they should be making. If anyone out there has any ideas on how we can make a presenting case, I'm all ears! In order for this to become a priority, I must rely on you, my readers, to influence the people who need to be convinced! I remember you mentioning this a while back, and am glad to get some more info on it. I hope all goes well for them! They have never even once demonstrated the "feedback" control mechanism that they say they have. All they do is put together gels that bleed insulin at different rates, giving just enough data to attract funding and provide for an executive lifestyles for the founders. Does this potential therapy have potential for Type II as well? Ignoring the "lifestyle" comment, does anyone know if the comment about feeback control is true by the previous poster?